ANTS uses equipment that has been developed by the United States Tennis Association (USTA) to help children of all ages learn the sport of tennis. ANTS takes this equipment and puts it into the hands of tons of children! Yes, the game of tennis in now easier to learn and play, and that's why we at ANTS work hard to give ALL children the opportunity to play and love tennis! ANTS believes that kids need a healthy & active environment to grow up in. 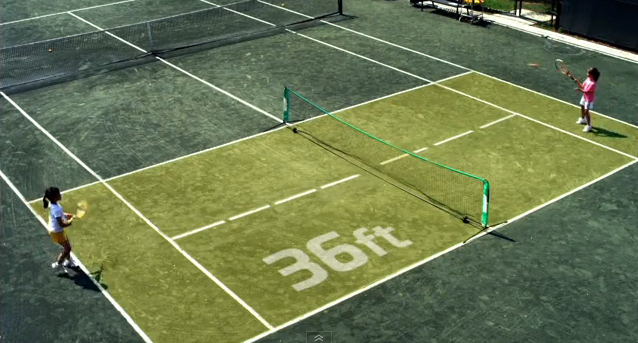 That is why ANTS is making community-wide efforts to establish tennis leagues for ages 3-12. ANTS has a “Healthy Habit Development” curriculum that has been written up by a professional team of doctors, and is intertwined within our program’s philosophy, coaching, and playing. ANTS goal is to have a positive, lasting impact on each child, family, and community we touch. It is also our belief that children need to play as many times as they practice. It is a proven statistic that if they do not play as much as they practice, they will lose interest after 3 years. It has also been proven that if they play matches as many times as they practice, they will develop 4x faster! That is why ANTS works so hard to offer a tennis program in a way that nobody else has—community-wide leagues! ANTS Tennis is a program that takes tennis, an individual sport, and turns it into a team sport. ANTS is also the only organization that puts your child onto a team, and promises they will play matches as many times as they practice! Your child will practice once a week, and play matches once a week, on a team. This philosophy is proven to develop children up to 4x faster! We are a firm believer in learn as you play and compete in a healthy environment. It is very important to ANTS that our players feel like they are part of a team. Players take part in matches on the weekends that implement both “team challenge skills” and “individual skills” they have learned at practice during the week. This approach maximizes the opportunity to develop as an independent tennis player, while having fun playing in supportive, team environment. ANTS is here to provide children season after season of community-wide tennis, allowing them to progress through a system that is going to develop them best, while offering the best environment to be a part of. By being part of a team, children are able to feel part of something larger and more fun, while progressing through a new system that is crucial to their development. By growing up using properly sized equip-ment, and using the proven methods of playing matches as much as practicing, ANTS players are being put on the right track of development. It is important that they play in accordance to age and ball type. This allows them to explore and develop any and every possibility the ball, racquet, net, and court offer. It is more important they develop on the appropriate sized court than it is to develop “faster and move up”.